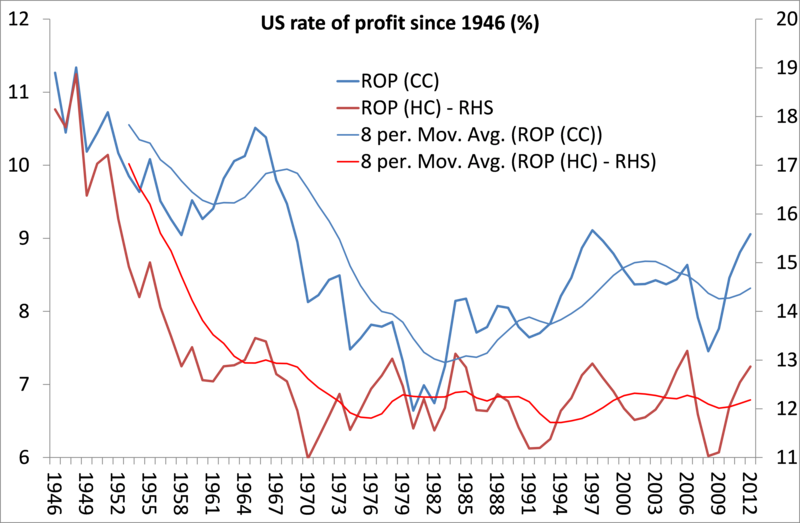 US rate of profit – up slightly in 2012, flat in 2013, down in 2014? The latest data on profits and fixed assets have now become available in the US to make the most accurate calculation of the rate of profit (ROP) a la Marx (to use Dumenil and Levy’s approbation) for 2012. The data come from the Bureau of Economic Analysis (BEA). As I did last year (see my post mr1112), I have updated my calculations. There are the usual issues of what to measure: 1) total value in the US economy or just corporate profits or just non-financial corporate profits; 2) net fixed assets of the whole economy or just the private sector; or just the non-residential private sector or just the corporate sector or just the non-financial corporate sector; 3) fixed assets measured in historic or current costs and 4) including employee compensation as a measure of variable capital or not. I have discussed all these measurement issues in my paper to the AHE back in 2012 (The profit cycle and economic recession) and in last year’s post. I reckon the closest measure of the rate of profit a la Marx is to use the net operating surplus in the whole economy as a measure of surplus value (BEA NIPA table 1.10 line 10) divided by net private fixed assets in historic (HC) and current cost (CC) terms as a measure of constant capital (BEA table 6.1 line 1 and BEA table 6.3 line 1) and employee compensation for the whole economy as a measure of variable capital (BEA NIPA table 1.10 line 2). Inventories ought to be included in the estimation of constant capital and it can be done, but the inclusion does not make much difference; so to save some work, I have left inventories out. To be as close to Marx’s formula of the rate of profit (s/c+v), I include variable capital in my calculation, unlike other analysts. They leave it out because it is considered circulating capital with a turnover of less than one year (or the period of calculation). So it is not a stock but more flow, as wages are turned over more frequently. However, G Carchedi and I do not agree (we have an unpublished paper on this issue). We think the removal of variable capital is not correct theoretically and unnecessary practically as the BEA data do take the turnover issue into account. But that discussion is for another day. Here is the graph showing the US rate of profit as I measure it, based on net fixed assets in both current and historic costs measures. The table below shows the level of the ROP at the end of certain periods compared to the start, expressed as a fraction of 1. So, for example, in the whole period from 1946 to 2012, the US ROP fell 20% (from 1.0 to 0.80) in current cost terms and 29% (from 1.0 to 0.71) in historic cost terms. The key points from the data are not much different from last year’s. First, there has been a secular decline in the US ROP from 1946 to 2012 or from 1965 to 2012; with the main decline between the peak of 1965 and the trough of 1982 (however you measure it). The ROP measured in current costs has risen since reaching a trough in the early 1980s, while the ROP measured in historic costs has been more or less flat (looking at the moving average in the graph above). Second, there was a rise in the ROP between 1982-97, 35% under the CC measure and 12% under the HC measure. Third, from 1997, the ROP has fallen in CC terms and been basically flat in HC terms. Fourth, the ROP at its trough during the mild recession of 2001 was still higher than at the ROP trough during the deep recession of 1980-2 (24% higher under the CC or 2% under the HC measure). However, the ROP in the trough of the 2008 Great Recession was 11% (CC) and 6% (HC) below the 2001 trough, although it was still 10% higher on the CC measure than in 1982 (5% lower on the HC measure). What these points show is that Marx’s law of profitability holds good for the US: there is a tendency for the rate of profit to fall over time in capitalist accumulation and this tendency will overcome the counteracting factors eventually. But it also shows that, for a period, and especially after a major slump that devalues existing capital, counteracting factors can rule – namely a rising rate of surplus value, higher profits from overseas and the cheapening of constant capital through new technology, among others. That was the experience of the so-called neo-liberal period from 1982 to the end of 2oth century. But even this neo-liberal ‘recovery’ period, with the dot.com bubble of the late 1990s and the credit-fuelled property boom after 2002, was not able to restore overall profitability back to the high levels of the mid-1960s. The ROP peaked in 1997 and the recovery in US profitability during the 2000s and since the Great Recession has only got the ROP back to that 1997 peak. This is what I said in last year’s post on the US rate of profit and I think it still holds: “when the organic composition of capital fell, as in the neo-liberal period, due to the slump in the early 1980s and then from the cheapening effects of new technology in the 1990s, the rate of profit rose. But in the 2000s, those cheapening effects have worn off and organic ratio has risen back to levels not seen since the crisis period of the 1970s. But this time, the rate of profit has not fallen as much because the rate of exploitation (surplus value) has also risen, unlike in the 1970s. The rise in exploitation and growing inequality (well recorded by many and in this blog) may lead to social upheavals down the road, but it does help to keep the rate of profit up. But there are limits on increasing the rate of exploitation and the US economy has probably reached them, especially with productivity growth slowing and real GDP growth so weak. So the current rate of profit can only be sustained by a sharp fall in the organic composition of capital. That can only happen if there is large depreciation of the value of the means of production (and in fictitious capital, as I have discussed in previous posts). And that means another slump or recession, perhaps equivalent to 1980-2”. I had forecast a fall in the ROP for 2012 last year, but that has not happened. My measure of the data show that the ROP rose in 2012 from 2011 by about 2-3%. A small rise but up, nevertheless. Where to now? As we near the end of 2013, can we make an estimate for the ROP in 2013 and beyond? Well, we can make some reasonable extrapolations on the changes in the variables involved in the ROP, namely net fixed assets, employee compensation and surplus value. In doing that, I find that there may have been a very small rise in the US ROP of about 1% in 2013 using the BEA data. But we can also use the quarterly measures for calculating the ROP from data provided by the US Federal Reserve to see how things are going in 2013. The Fed measures are for the corporate sector only and not for the whole economy, so are not strictly comparable with the BEA data I have used. I take Fed data for net operating surplus in the corporate sector (for profits) against tangible assets measured in both current and historic costs (for constant capital) and include employee compensation (for variable capital). The results show a recovery in the corporate ROP since the trough of late 2008, just as the BEA data for the whole economy does. 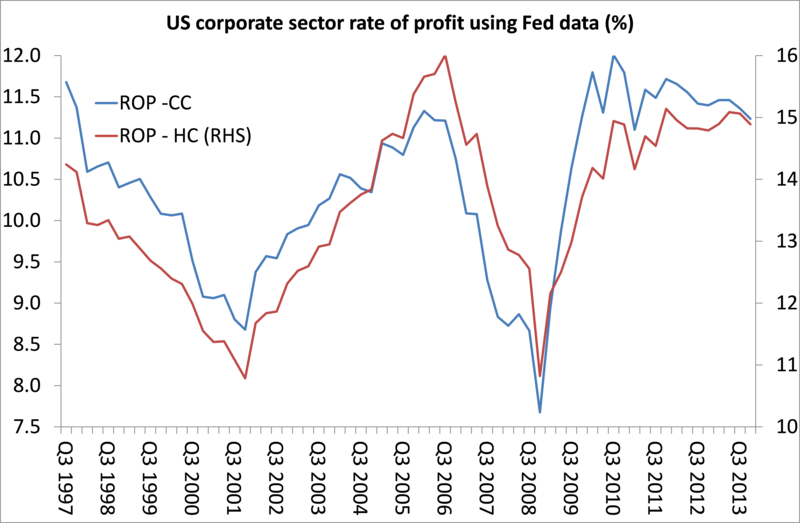 The Fed data also show that the corporate sector ROP in 2013 is below the pre-crisis peak of 2006 on both CC and HC measures. And the ROP was down slightly in 2013 on average compared to 2012 on a CC basis (by about 1%) and flat on an HC basis. Basically, the US ROP stopped rising in 2013. Most important for forecasting another recession is what is happening to the mass (or total) of profits. Usually, if the rate of profit starts declining consistently, at a certain point, the mass of profit will start to fall. When that happens, investment drops off fast a few quarters later and then the capitalist economy slips into a slump. Both the BEA and Fed data suggest that the mass of profits is still rising, but at a slowing pace. So no recession is imminent. Growth in the mass of profit will probably slow further next year. There is good reason to believe this for other sources apart from my own. Albert Edwards, the investment guru at the French bank Societe Generale, reckons that US corporation’s ability to raise prices is not keeping pace with a rise in labour costs per unit of production. In other words, profit margins, having rocketed after the trough of the Great Recession, are now reversing. So the next recession may not be imminent, but the US ROP now looks as though it is heading down from here, as profit margins start to fall. If that leads to a fall in the mass of profits in 2014 or maybe a little later, another recession would follow soon after. This entry was posted on December 16, 2013 at 12:15 pm and is filed under capitalism, economics, marxism, Profitability. You can follow any responses to this entry through the RSS 2.0 feed. You can leave a response, or trackback from your own site. A secular decline implies a steady downward trend with only very short term divergences, but even a cursory look at the graph shows this not to be the case, certainly for the rate of profit on current costs. Its shows a secular decline from 1946 to around 1979-82, but an equally secular rise from around 1982 to 2012! That is without taking account all of the issues of measurement you mention, and the rise in the rate of turnover of Capital during that period, which has the effect of raising the current annual rate of profit three fold compared to the rate for 1950! Taking that factor alone into consideration would give a current annual rate of profit – even on the historic costs basis – of around 39%, compared with only 18% on a comparative basis for 1946. Using your own data then it would seem that the Rate of Profit today is double that of 1946 measured on a comparative basis. Its clear that the “Great recession” was not so great after all. But rather a serious albeit temporary blip. Actually your estimate underestimates the growth of profitability as it does not separate out tax revenues paid to the state from total surplus. These unproductive expenditures are counted as profits in your calculation. As taxes have fallen since the early 1980s this underestimates the upward trend. Including historic cost FCS is just wrong. It over estimates the rate of profit and conceals the trend. It overestimates GDP and underestimates depreciation. A look at US GDP also shows a typical “V” shaped recover, despite the efforts of the Republicans to scupper Obama’s fiscal expansion. The shape of the US recovery stands in stark contrast to that of the UK and EU, where austerity measures have prevented a similar recovery. Also, a look at GDP data for the rest of the world shows the idea of a “Great Recession” to be false. In fact, its only in the North Atlantic area where economies went into a recession at all. China continued to grow in high single digits, as did, and other asian economies continued to grow throughout. A look at the new developing areas of the globe in sub-saharan Africa shows an even more vibrant picture. Economies like Ethiopia have had higher growth rates even than China. The average rate of growth of developing sub-saharan Africa has been around 6% throughout. A study of Marx’s analysis of the Rate of Turnover also provides another example of what is wrong with Historic pricing, and how it differs from Marx’s method of calculating the Rate of Profit. Note Marx’s terminology here. Firstly he begins by making clear that what he is talking about is “the advanced productive capital”. To make clear it is not the advance of the money-capital used to purchase that productive capital, that Marx is talking of, he then says that what he is doing is only to “fix all its elements in the money-form”. Finally, to make clear that his analysis here is one based on the actual capital-value advanced, and not on the money-capital advanced, he makes clear that the use of money here, is merely a convenience of calculation, and that he is using it essentially only in its role as “money of account”. Consider the importance of this in relation to the question of the rate of turnover, and its effect on the rate of surplus value and profit. Take a restaurant, and consider only the rate of surplus value. What is the turnover period of the variable capital? Well the variable capital is advanced every day in the form of the capital-value of the labour performed by the chefs, kitchen staff, and by the waiters. Customers also consume the output of this labour on a daily basis. The customers pay for their meals in cash, which is then available to be paid out as wages immediately. So, the turnover time of the variable capital is 1 day. If the restaurant is open 350 days a year, the capital turns over 350 times a year. If the labour creates £100 per day of new value, and of this £50 constitutes surplus value. The Rate of Surplus Value is 100%, but the annual rate of surplus Value is ((50 x 350)/50) x 100 = 35,000%!!! However, assume that wages are paid one month in arrears. In that case, in fact, no money capital has been paid out at all. No money-capital is ever advanced for wages, because wages are always paid out of receipts! On an historic cost basis, its impossible to calculate a rate of surplus value on the basis that Marx does, because no money-capital was ever advanced. The denominator in the calculation would be zero, meaning the rate of surplus value would be infinity! But, as Marx points out in the statement from Vol II above, the calculation of the rate of surplus value is not made on the basis of the money-capital advanced, but on the basis of the capital-value advanced to production. In fact, although the restaurants wages are not paid until a month after the value produced by it has been returned many times, the capital-value of the labour has itself been advanced every day, and it is on that advanced capital-value, not the payment of money-capital that the rate of profit, for Marx is calculated. On Boffy’s point about turnover. Increased turnover is accounted for in the NIPA, which are an aggregate of all the expenditures in a given category in a given year. If turnover time accelerates, then the OCC falls and rate of profit increases, as there is a lower proportion of constant capital relative to variable and surplus, but this will be shown in the figures, as the stock of fixed capital will not change, but the flow of constant and variable capital will increase relative to it and of the proportion of surplus value relative to fixed costs, so all things being equal, the rate of profit will rise. On the issue of whether it matters if wages are a flow or a stock the same applies. It doesn’t matter. Everything is a stock or a flow depending on the time period used. Wages must be included in the calculation of the rate of profit as they are the largest cost expended by the employers. Those calculations that exclude wages, underestimate the recovery in profit rates during the neo-liberal period, as wages have fallen as a proportion of national income. Generally Michael’s calculations are definitely pretty close IMO and they reveal the trend. Sharp fall from the late sixties to early 1980s. Slow recovery during the 1980s. Faster recovery from the 1990s onwards. 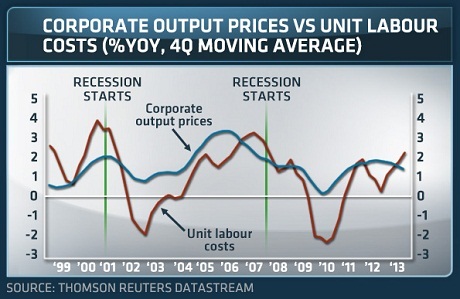 With ups and downs for the business cycle. It doesn’t account for changes in the rate of turnover of capital. The data is for the total capital laid out during the year, not the capital advanced. The importance of that is given in Vol II dealing with the effect of a rising rate of turnover of capital on surplus value, and in Vol III, dealing with the effect on the Rate of Profit. Its impossible from the NIPA data to determine the number of times that Capital is turned over during the year, or to know what the turnover time is. All we can know is that as productivity rises the rate of turnover will rise. The actual basis for calculating the rate of profit is s x n/ c+v, where n equals the number of turnovers during the year. The calculation of profit in the NIPA data is basically Income less expenses, where expenses is the total capital laid out during the year. If we take the profit figure as the proxy for surplus value, then it must be multiplied by the number of times that the capital is turned over during the year. We don’t know what the value of n is, so we can’t do that. But, if we calculate that the value of n today is approximately 3 times what it was in 1950 (an approximation based on a 2% p.a. 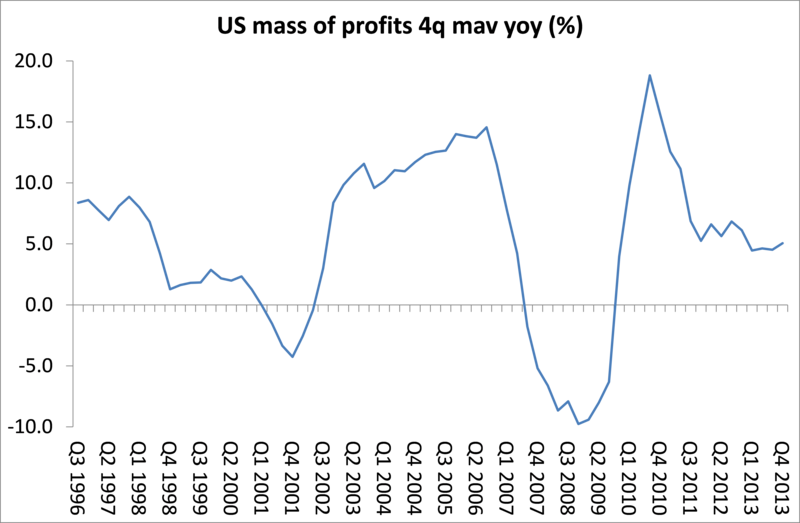 rise in productivity) then we know that to compare the 1950 profit estimate with today’s, we have to multiply s by 3. Both figures underestimate the real figure for the rate of profit, but at least it gives you a comparison of today’s figure with that for 1950. In Capital, Marx and Engels estimated the rate of turnover to be around 8 times a year – though I have issues with the way Engels, in particular arrives at that figure. On the basis of this rate of turnover, and using actual data, they arrived at an actual rate of surplus value of around 3000%. Surplus value doesn’t need to be multipled by turnover as the NIPA is the total of surplus value realised in a year. Turnover changes the proportions of the OCC, and so raises the r.o.p. but it makes no difference to the annual mass of profit. To calculate the annual rate of surplus value and profit consistent with Marx’s method as set out in Vol II and III it does. The method Marx and Engels use is to take the the surplus value produced in one turnover period, and multiply it by the number of turnovers in a year. As you say, this is the same as the actual figure for annual surplus value. But, Marx and Engels calculate the Rate of profit as this annual amount of surplus value related to the Capital advanced (c + v) in the turnover period, NOT the year. The annual figure for c+v is the capital laid out not advanced. Suppose, we ignore fixed capital. Weekly wages are £100, and weekly spending on constant capital is £400. If we have a 48 week year, and the turnover period is 8 weeks, that gives a rate of turnover of 6. The advanced capital is (£400 + £100) x 8 = £4,000. The Capital laid out in the year is £24,000. If we assume the Rate of Surplus Value is 100%, then the annual rate of surplus Value is 800 x n/800 x 100 = 600%. The Annual Rate of profit is 800 x n/4000 x 100 = 4800/4000 x 100 = 120%. If the turnover period falls from 8 weeks to 6 weeks, the total amount laid out in wages and materials over 48 weeks does not change. It remains 48 x (£100 + £400) = £24,000. The amount of surplus value produced in the year remains the same too i.e. 48 x £100. However, the advanced capital has now fallen. The advanced Capital is now 6 x £500, as opposed to 8 x £500, i.e. £3000 rather than £4,000. So, now the annual rate of surplus value is 4800/600 x 100 = 800%, even though the rate of surplus value itself remains 100%. The rate of profit is now 4800/3000 x 100 = 160%. The NIPA data gives the annual figure for profits, which provides the numerator, but the denominator is based upon the capital laid out during the year, not the capital advanced in the turnover period. It can’t give the capital advanced in the turnover period, because nowhere is the turnover period identified. A further problem arises with the fact that even in terms of the capital laid out, the only capital identified is actually the variable capital, plus the fixed capital stock. It omits, the circulating constant capital that is not exchanged. This is the same mistake that Smith made, and which Marx describes in Capital II. The simplest way of understanding it is to assume that the economy is made up of Marx’s two Departments, and to consider both departments to be single companies. c 200 + v 50 + s 50 = 300. If we look at this economy, the incomes received as wages, interest, profits, rents etc. are contained in the revenue payments I (v+s) and II (v + s). These are the income figures contained in the NIPA data, and all other data for National Income, and Expenditure. But, the total for these incomes comes to £300, whereas the total value of output of this economy is £900. The output of department II (£300) finds its demand from the revenues in both departments. Department I’s revenues are produced by selling £200 of constant capital to Department II. But, if we look at the data, then as Marx points out it is clear that there is £400 of output value that is not traded, and produces no revenues for anyone. It is an exchange of capital with capital, not capital with revenue. This £400 shows up in the national accounts neither as income or expenditure, because it is effectively not traded. If we consider Department I as just a single company, it is as though it is a coal mine that uses some of the coal it produces itself, to power the steam engines that pump water from its own mines. Consequently, the National Income Accounts always understate the amount of value produced in the economy, because as Marx sets out in Vol II, they do not include the value of circulating constant capital that was produced in previous years, but whose value appears in this year’s production. Its why he says that the Physiocrats were right as against Smith, in that in the Tableau Economique, the starting point is not this year’s production, but last year’s harvest! Given that it is changes ion the value of the circulating constant capital that Marx describes as having the greatest impact on the Rate of Profit, calculations that omit it, are seriously flawed as an indication of changes in the Rate of profit. Well indeed they do, but you can obviously calculate the rate of profit per cycle and per year. The total for the year aggregates the cycles, it will be different from each cycle, but derived from them. For the reasons I set out in the calculation the annual calculation will not simply aggregate the rate of profit per cycle, precisely because the basis of calculating the rate of profit as the annual profit divided by the annual figure for expenditure/capital laid out must give a different figure for the rate of profit than where it is calculated as Marx and Engels do, as the annual profit divided by the Capital Advanced, i.e. the Capital advanced for one turnover period. In the example above, calculating the rate of profit on the basis of annual profit/annual capital laid out gives 4800/24000 = 20%. However calculating the Rate of Profit as Marx did as Annual profit/ capital advanced you get with an 8 week period of turnover 4800/4000 = 120%, and with a 6 week period of turnover 4800/3000 = 160%. As Marx points out, it is not just that the rate of profit is increased as a result of this reduction in the period of turnover. The other consequence is that Capital itself is released. In this case, a reduction in the turnover period from 8 weeks to 6 weeks releases £1,000 of Capital, which could be used to expand production by 25%, and thereby increase the amount of surplus value by 25%, or it could be utilised in some other form of production, with the same consequence. A change in the period of turnover has no effect on the OCC, as the above examples show. What a change in the period of turnover affects is the proportion of Circulating Capital to Fixed. So, if in the example above there had been £1,000 of fixed capital required for production, then the ratio of circulating to fixed capital would have changed from 1,000: 4000, to 1,000:3000. The rate of profit changes not because of a change in the OCC, but because the amount of advanced circulating capital falls. As we don’t know what the actual turnover period is, and because the rate of profit in all of the instances, is therefore based on the annually laid out capital (actually only the laid out variable capital plus sometimes the fixed capital) it is as though the rate of profit has been calculated as though capital turned over just once during the year! But, we know that is not the case, and we know that as a consequence of changes in productivity, the rate of turnover has been increasing substantially. So, the only way to compensate for this is to take the calculated rate of profit for the year, and multiply this rate by an estimate of the extent to which the rate of turnover has risen. Using an average 2% pa. rise in productivity as a proxy for the rise in the rate of turnover (probably a significant underestimate) you arrive at an estimate that the rate of turnover is 3 times higher today than it was in 1950. Adjusting the calculations of the annual rate of profit, you then arrive at the conclusion that today the US Rate of Profit is considerably higher than it was in 1950. Michael, are these profit rates inflated by fictitious capital (credit money/debt)? I think they are. There is a new paper out by Peter Jones on this very point. In a future post, I’ll try and deal with this issue and also come back to other recent work on measuring the US rate of profit that I think helps to confirm my interpretation of the data. But that may have to wait until after the seasonal period! Fictitious profits are not included in the NIPA.